Lidded Serving Dish. 'England's Countryside' Pattern. Myott Son & Co Hand Painted Jug. Made in England. Makers mark underneath. Stamped 8693 Regd. No. 789315. Made by Myott, Son & Co.
Pottery Alfred Meakin and Myott - Royalty, burgundy gilded. Condition is Used. Dispatched with Royal Mail 2nd Class. These traditional large round serving dishes and matching gravy jug are perfect for any Myott collector or fine china enthusiast! & Gravy or Sauce Jug. 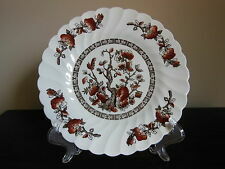 New listingMYOTT 'Rialto' Lovely large (15") maroon meat plate/platter. Perfect. MYOTT 'Rialto' pattern (maroon) Large 15" meat plate/platter. Excellent condition - please see photographs. Thank you for looking and please take a moment to view my other listings. By Myott, England. Milk Jug 8 cm high x 12.5 cm lip to handle x 7.5 cm dia base. Saucers 14cm dia. Coffee Pot 25 cm high inc. lid x 22 cm wide inc. spout and handle x 9.5 cm dia. 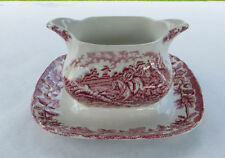 Sugar Bowl 7.7 cm high no lid x 10 cm high inc. lid x 8 cm dia. Set Of 4 Vintage Myott Soup Bowls With Handles. Royal Mail Pattern. Set Of 4 Vintage Myott Soup Bowls With Handles. Royal Mail Pattern.. Dispatched with Royal Mail 2nd Class. Excellent condition except one bowl has a mark/stain in the bottom which doesn't seem to want to budge, (see pics). Brown multicolour which I believe is hard to come by. Lovely! Great little Myott sugar bowl/pot - to complete your set or to use on its own as a display piece or storage jar for anything you can think of! Measures approximately 12cm wide and 11cm tall. Please examine photos to see close up the condition of this item - please remember that this is a vintage item and will show signs of its age, but this piece is in great overall condition. I only sell things that I would be happy to buy myself, and take as many photos as I can but please get in touch if you have any questions at all. Happy to combine postage where possible, and I have other vintage home wares and ceramics for sale, please take a look at that section of my shop. Thanks! Small Hand Painted MYOTT Bowl - Embossed Flowers and Gold Gilt Decoration - 13cm Dia x 3cm H - No Crazing, Some Wear To Green Band & Gold Gilt - See Close up Photo's for Flaws. This large tureen measures approx 10” in diameter and 8” in total height. It is in good condition with a very small hairline crack measuring about 1” to the top rim. It isn’t visible unless you look carefully! Vintage Myott Camilla Coffee Pot & Sugar Pot made in Staffordshire Made in 60s this distinctive design became a classic and is still popular today why not own a piece of history ! This sugar bowl and coffee pot are in excellent condition with no chips or cracks . Dispatched with Royal Mail 2nd Class. Marked with the Myott & Co mark and pottery pattern "8387". Hand Painted Orange Black & brown colours. Art Deco Myott & Sons Pattern 8662 Diamond Shaped Vase Flower Arranger Frog Hand Painted c1935. We are only passing on the costs associated with getting the item to you safely and in one piece. REST OF THE WORLD : International Standard £23.58. Rare Myott 'THE BROOK' Lord Tennyson Poem. Myott, Fine Staffordshire Ware. on the Lord Tennyson poem 'The Brook'. Large 11.5' Cake/Cheese Plate 1970's. I loiter round my cresses. I linger by my shingly bars;. Lovely for serving sandwiches or cakes. Condition Surface good, crazing and slight staining underneath with age. Perfect for useable tableware or display. Lovely for serving sandwiches or cakes. Backstamped as above and Made in Staffordshire England. MYOTT SPRINGWOOD CUP & SAUCER. 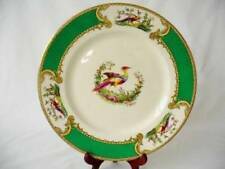 Myotts Royal Crown - Square Handled Cake Plate - Chelsea Bird - 10.5” Used small chip to the rear cannot be seen from front. Wear on surround as seen on photos. Please see our other pottery including Portmeirion items. Postage can be combined depending on weight 2/3 items £6.99 4 on request. All our items are sent bubble wrapped, boxed and by tracked courier. Please favourite us to see new items every week. P&P is shown for UK delivery. We are happy to post to Europe and USA please ask for delivery costs as items vary by weight and size. All import duty and tax is the responsibility of the buyer. Sauce / Gravy Boat / Jug. Decorated with the England's Countryside Pattern. 21 cm from handle to spout & 7.5 cm high. Rare 1930s Stoneware bowl by Myott, England. A bright orange basin with black silhouettes of dancing nymphs on a white background. 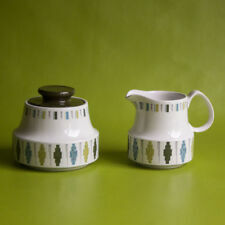 Matching jug available. 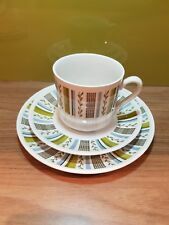 Super vintage cups & saucers. Beautiful bright colours. Myott Son & Co England's Countryside. Hanley. Fine ENGLISH china Art Deco / 30’s Cups are 6.5 high. Jolly Fisherman Skegness 80th Birthday Plate 21cm across. Super vintage part set in great condition. No chips or cracks. Beautiful bright colours. 9 pcs. Myott Son & Co England's Countryside. Hanley. Fine ENGLISH china Art Deco / 30’s 2 coffee cups 2 saucers 2 side plate 1 larger plate / server? 1 creamer / milk jug. 1 sugar bowl. MYOTT'S QEII CORONATION PATTERN BONE CHINA TEA DUO CONSISTING OF TEA CUP AND SAUCER. Tea Set Duo - Teacup, Tea Saucer. DATE: 1953. MATERIAL: Staffordshire Bone China. ORIGIN: Hanley, Stoke-on-Trent, Staffordshire. MYOTT STUDIO POTTERY. MODEL: 512/1. MADE IN ENGLAND. RARE & HARD TO FIND COLLECTABLE HANDMADE MYOTT POTTERY IN EXCELLENT (MINT) CONDITION. CLEAN & READY TO DISPLAY. HAND PAINTED CERAMIC JUG. VIBRANT COLOURS. Small chip on base of jug see pics. A pair of very funky espresso/coffee/tea cup or mugs in turquoise, browns and olive green 70's styled floral design. See all the photos for proof of condition. A lovely Myott & Sons co. Ltd Deco era 'England's Countryside', with a transfer printed and hand painted plate with traditional English countryside scenes of half - timbered houses, a countryside panorama, trees, and a chequerboard pattern.